I know its been some time since I last posted, life again has gotten out of hand but what else is new? School is now starting to wind up and ramp up at the same time. Only 3 weeks left I believe at this time but that also means finals are coming. I sure hope that they aren’t too bad this year. There is now a running joke at my local knitting group that yarn will never leave you. Which is very true, you don’t have to worry about it not being happy with you, it will happily sit in stash till its time is right. It will never complain about not being able to spend enough time with you (that would be a WIP that complains, not the yarn). You can always count on it to be there for you, patiently waiting for you. It may call to you every so often, asking you to pick it up and just squish it and feel it’s beautiful fiber. It may just ask you to look at its beautiful colors and remember where you bought it, where you were with, and bring back memories of a good time. Not only that but it will stay there with you even after its knit up, faithfully by your side or neck or body. It will keep you warm or cool depending on its fiber content. Yarn is just a wonderful thing, something that I’m very glad to have with me. The joke comes from when you’re broken up with as a knitter you will always have yarn because it will never leave you. To spare all of the details I needed some yarn that could be knit into something as a it will never leave you like some have. At my LYS, we got back in malabrigo about 2 weeks ago and of course I had some sitting in front of me while I was there for knit night. But none of it really spoke to me, yes it was pretty, but not right for what I wanted. The group had told me that if it was going to be a special exception to the social pressure experiment that it should be something amazing. So I put the malabrigo back, but then I saw it, something that I had seen there before and just forgot about. 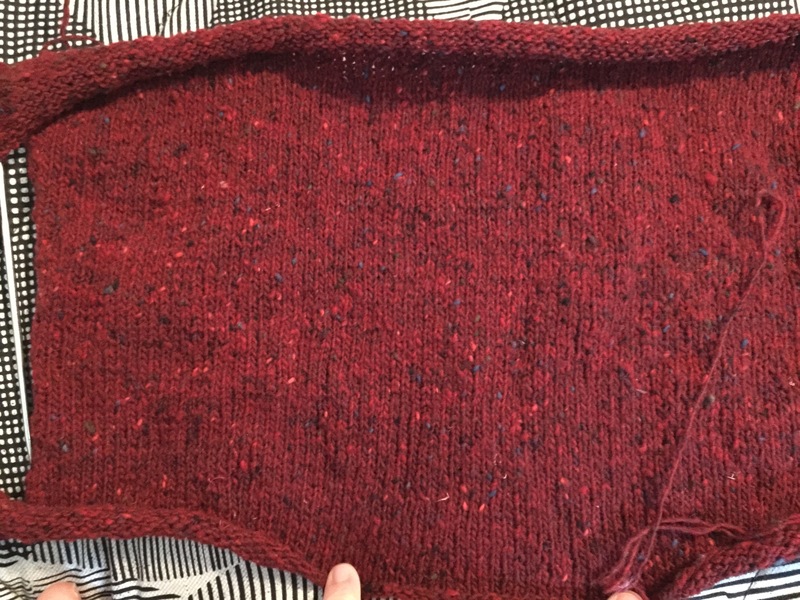 A donegal tweed in this gorgeous red, it made my heart sing as it told me what it wanted to be. I knew then that would be the yarn, I checked quantities and the shop had the exact number I needed. So, pattern at the ready, yarn then purchased I got the new yarn. I diligently did my swatch that night, after it got blocked, I was right on gauge. I cast on and knit when I could. There really isn’t anything amazingly interesting about the pattern but it simple, classic, and will wear really well. The yarn that I picked mimics the original yarn, even though I would have like to have a sweater quantity in Brooklyn Tweed Loft in Long-johns. But the Debbie Bliss Fine Donegal is a perfect substitute for me. Now I’m almost halfway through the back of Redford, which I think will be perfect. I want to get this done so I will have sweater for a trip that I’m taking this summer. More on that later. If you get anything out of this today is that Yarn is always a good investment, because it will never leave you.